America's job market remains one of the few bright spots in the economy. 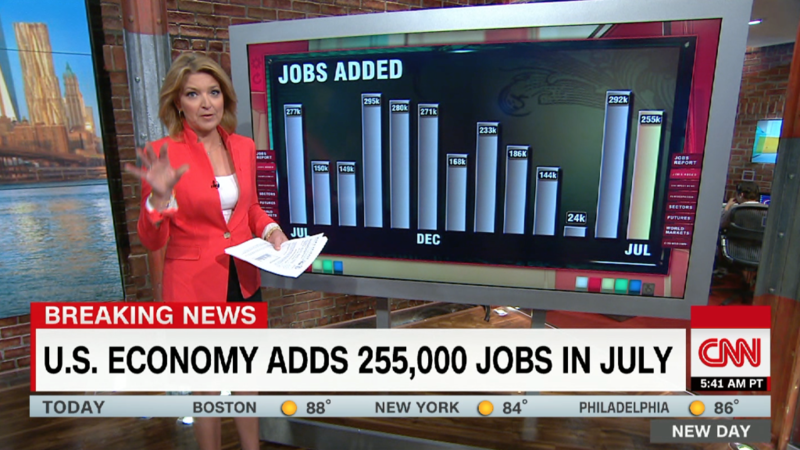 The U.S. economy added 255,000 jobs in July and the unemployment rate remained at 4.9%. It far surpassed expectations of economists surveyed by CNNMoney, who had predicted a gain of 182,000 jobs. "Employment growth remains strong," says Jim O'Sullivan, chief U.S. economist at High Frequency Economics, a research firm. So far this year, America has added about 1.3 million jobs. That's a healthy improvement but still a slightly slower pace than last year, when it had gained about 1.6 million jobs by this point. Job gains for May and June were revised up a bit too. Wage growth continued to show signs of more momentum. Wages grew 2.6% compared to 2.2% the same time a year ago. It's better, but still low: Prior to the recession, wages were growing at between 3% and 3.5%. It's one of the last areas of the economy to really turn in the right direction, and a major reason why American don't feel great about the economic recovery. "It's headed in the right direction but there's still a long way to go," Heidi Shierholz, chief economist at the Labor Department, told CNNMoney Friday. America continued to show it is increasingly focused on service industries like banking, health care and education, and less on sectors like manufacturing and mining. Business services -- which includes a wide range of jobs such as computer designers and engineers -- led the pack with 70,000 news jobs. Health care, financial services and hospitality also gained more positions. America's mining sector lost 6,000 jobs in July. Employment in construction and manufacturing had small gains. Experts caution that despite the strong numbers in July, job growth can't sustain this pace with unemployment so low. "Jobs reports like this, where everything comes up smelling of roses, are very rare," says Joseph Lake, global economist at The Economist Intelligence Unit, a New York firm. "This rate of job growth will not be sustained." Outside the job market, warning signs are flashing. U.S. growth has been weak this year, averaging 1% in the first half. Many American companies, such as Ford (F), Kate Spade (KATE) and Office Depot (ODP), have reported disappointing earnings. Americans are still spending at some stores and restaurants, but businesses have pulled back significantly. The decline in business spending is a key reason why growth is so low.